With things still slow on the sea fishing front (but see next Saltwater page) I've been to the river again. 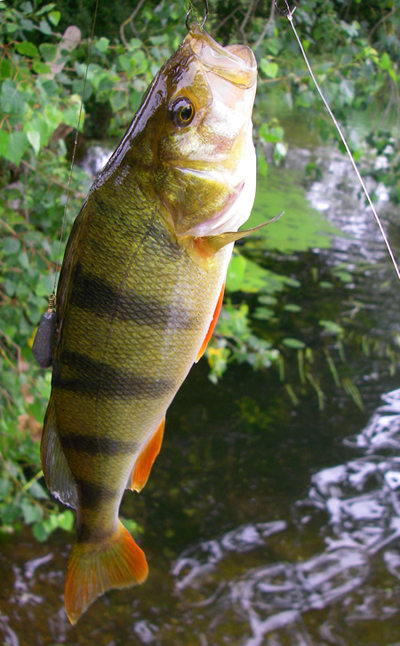 I started off fishing with a size 4 Mepps and after half-an-hour of nothing I hooked a decent perch. However, this was too slow for me (I become less patient as I get older) so I went back to the car and picked up my maggots, a bucket and a little float rod to try and catch some livebaits. The minnows were very obliging and it wasn't long before I had a dozen or more swimming in the bucket. I clipped a paternoster with a small weight and a size 6 circle hook on a wire trace, lip hooked a fat minnow and lobbed it out. Within seconds I felt 'bump, bump, bump' and tightened into a perch. 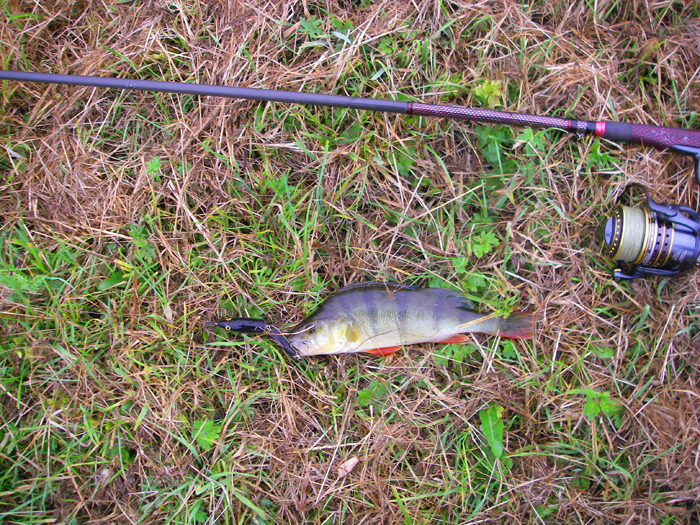 Almost every cast I had another perch with only the odd lull in the action. There's a limit to how much of this I can tolerate unless there seems to be a chance of a big fish so after catching dozens of perch I switched back to spinning, this time with a J9 Rapala. 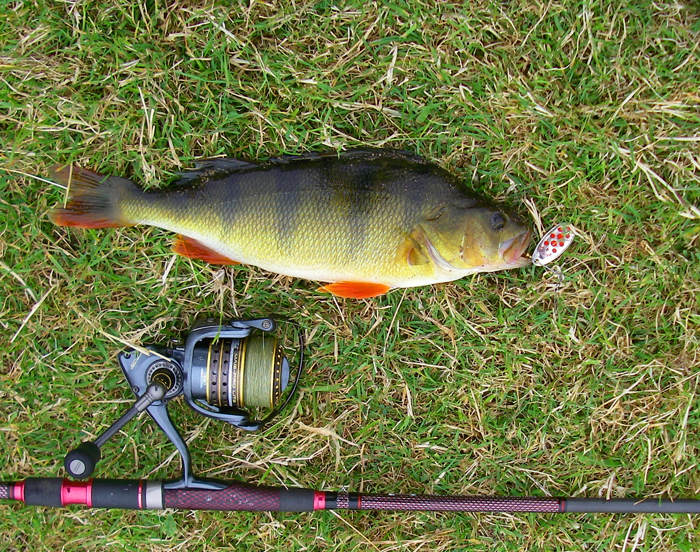 Needless to say my first catch on the plug was yet another small perch but I walked on downstream trying all the likely spots. The sport was much slower than when I was using live minnows but I lost a decent fish, probably a trout, which shook the hooks out before I could get a look at it. 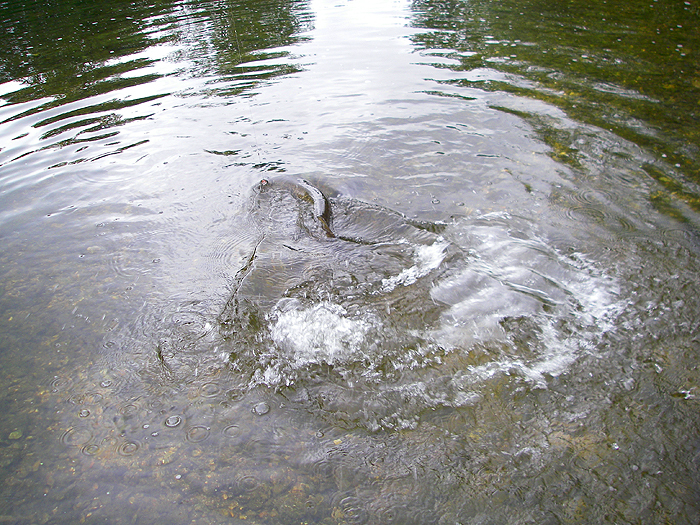 Eventually, near the bottom of the stretch I came to one of my favourite chub swims. 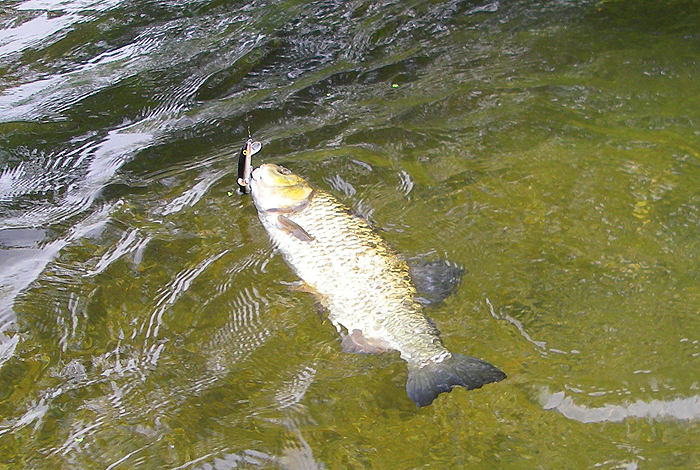 It's a deep glide which I can only fish by wading into mid-stream, casting up and retrieving with the flow. First chuck there was a heavy tug and a big swirl which I missed. On the next cast a bow wave followed downstream but I didn't have a bite. Usually two missed chances would be my lot but since I couldn't go any further I fanned out the casts to cover as much of the river's width as possible. To my surprise on about the fifth cast there was a swirl and I was into a fish. 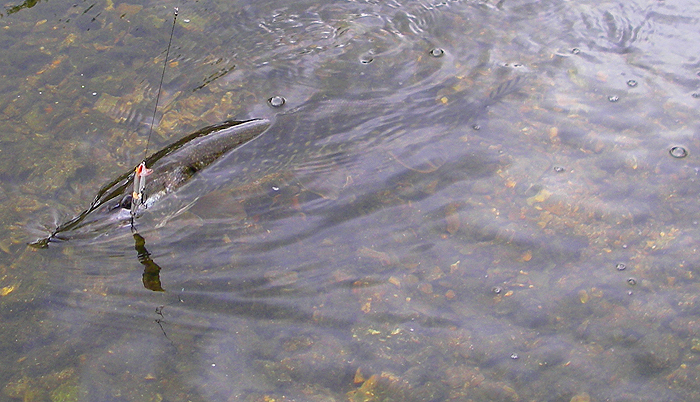 It pulled hard and I thought at first that I must have hooked a pike but it turned out to be a medium sized chub of between three and four pounds. I was pleased with the chub and set off on the long walk back to the car. Of course I couldn't resist having a few more casts as I trudged along the bank but it was only when I was almost back to my livebaiting spot that I hit another fish. This one fought much harder than the chub and turned out to be a fair sized pike of around eight pounds - quite a good one for the stretch I was fishing. All in all a very pleasant couple of hours.